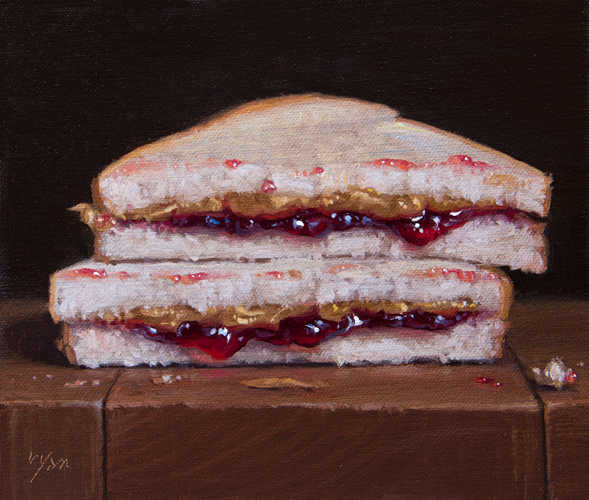 Sold ($1900), Still Life with PB&J Halves, oil on linen on panel, 2018, 6"x7"
This PB&J painting is larger than my typical auction paintings. It will be framed. Two of my paintings are included in the Masters of Illusion: The Legacy of John F. Peto exhibition at the Morven Museum in Princeton, NJ, from November 15, 2018–May 12, 2019. The Morven Museum has partnered with the John F. Peto Studio Museum to present a new look at trompe l’oeil art. Born in Philadelphia in 1854, John F. Peto is recognized as one of America’s most accomplished trompe l’oeil artists. The exhibit features Peto’s paintings and photography, and one of Morven’s galleries presents Peto's legacy through contemporary artists who have participated in the Peto Museum’s Tri-State Invitational Exhibition.